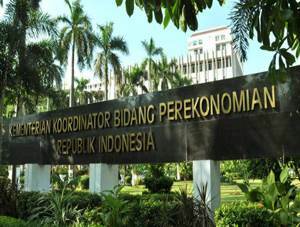 Kementerian Koordinator Bidang Perekonomian Republik Indonesia - Kemenko Perekonomian (hereinafter referred to as "EKON") is the Coordinating Ministry for the Economics Affairs of the Republic of Indonesia. EKON is one of coordinating ministries in the Indonesian Working Cabinet (Kabinet Kerja) which handles the coordination and synchronization of preparation and policy formulation and implementation in the field of economics.In the cabinet which lead by the President Joko Widodo (Jokowi), EKON lead 10 ministries for the economy which include the Ministry of Finance, the Ministry of Commerce, the Ministry of SOEs, the Ministry of Cooperatives and SMEs, the Ministry of Industry, the Ministry of Agriculture, the Ministry of Labor, the Ministry of Public Works and Public Housing, the Ministry of Environment and Forestry, and the Ministry of Agrarian and Spatial. Headquartered in Jakarta, EKON's head office is located at AA Maramis Building - Jl Lapangan Banteng Timur No 2-4 Jakarta Pusat 10710. Former of the central bank governor/Bank Indonesia,Darmin Nasution is the current Coordinating Economic Minister in the Working Cabinet. He was sworn as the Coordinating Economic Minister by Jokowi on 12 August 2015 to replace Sofyan Djalil who shifted as the Minister for National Development Planning / Head of BAPPENAS. According to EKON's profile as cited by JobsCDC.com, EKON has 7 deputies, 1 inspectorates, and 1 secretariat. The Coordinating Economic Minister supported by 7 expert staff. Male / Female, maximum age of 28 years old at the time of registering. Minimum Bachelor Degree (S1) majoring in Economics and Development Studies, with a minimum GPA of 3.00 on a 4-point scale. Technical expertise in Ms. Office usage (Word, Excel, and Power Point). Able to communicate with English actively (oral and written). Female, maximum age of 32 years old. Minimum Diploma Degree (D3) majoring in Communication Studies, Secretary, English Literature. Past experience as receptionist/secretary for minimum 2 years. Good looking (attach full-body photograph). Never sentenced to prison or jail based on court decisions that already have binding legal force, for committing a criminal offense (attach a stamped statement letter). JobsCDC.com now available on android device. Download now on Google Play here. Please be aware of recruitment fraud. The entire stage of this selection process is free of charge. Kemenko Perekonomian - D3, S1 Technical Support Expert Staff, Admin Staff EKON February 2016 will never ask for fees or upfront payments for any purposes during the recruitment process such as transportation and accommodation.